Have you been to Maryborough? It's home to THAT railway station but lots more so even if you've been there before, take another look! Follow up with Wal Richards Wedding Photographer at Central Goldfields Art Gallery, itself of interest, located in an 1861 fire station. Wal Richards documented local weddings over the course of 50 years and the exhibition is drawn from 100's of photos. 2 Neill Street Maryborough, open Thursday to Sunday 10:00am to 4:00pm; no admission charge. Sustenance of all kinds is available at the Railway Café and Tracks Bar Gallery also at the station, or at the recently opened Bull and Mouth in High Street. Feel like a drive? What about Creswick or Daylesford? The “tiny towns” of the Central Goldfields include Dunolly, Bealiba, Talbot, Adelaide Lead and others. These towns, once heaving with miners, are now small but in the case of some of them now heaving with artists ... Did we hear someone say Dunolly? What about dropping by some of the tiny towns on your way over to Bendigo for the day? The combination of Country driving, small townships and Bendigo's grandeur will provide plenty of experiences of gold mining, arts and culture and natural beauty to stoke up your enthusiasm for the Regional Centre for Culture. The Regional Centre for Culture is all about participation so these concerts are sung by the audience in beautiful small (cosy) municipal buildings. Come with the friends who sing in the car, band-mates and choir pals, your tone-deaf partners and get your great big voice on. Experts in different genres (a capella, folk, rock, country) will lead the concerts and accompany. Participation is free but we encourage bookings. If you’re not one for singing or you're looking for other things to do between concerts stop in at the Clunes Information Centre at the Warehouse and the Museum which is in the same building. For hiking try the Mt Beckworth Scenic Reserve, the Creswick Museum and Gold Battery, fishing in the local rivers, streams and reservoirs including lakes stocked with trout such as Creswick’s St Georges Lake and the nearby Newlyn Reservoir. 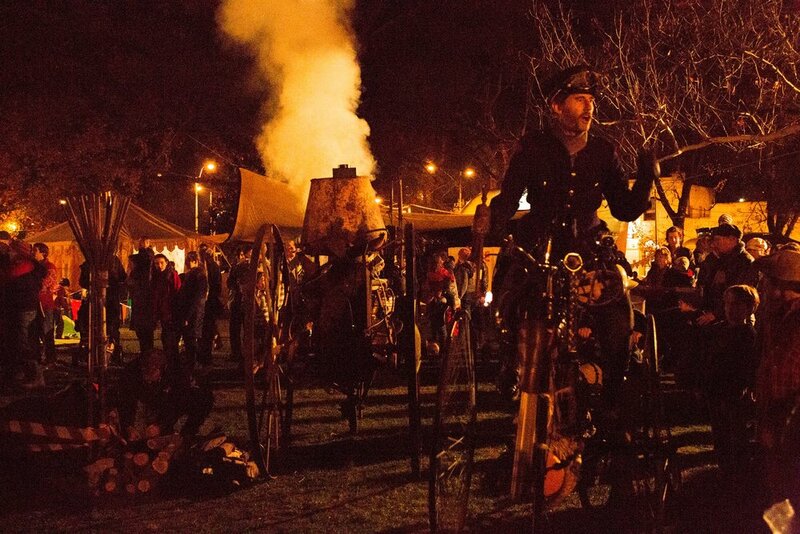 June 23 The The Village Festival Castlemaine is a major large-scale performance event that will take over the Newstead Racecourse and will bring together pyrotechnics, archery, sculpture and music, along with two of Castlemaine's other great loves, hot rod cars and machinery. June 24 Enjoy the Bendigo Symphony Orchestra’s world premiere performance of “…and I am but an echo” composed by David Chisholm, 2:30 pm at Heathcote RSL Hall.